Fire pit construction in Walnut Creek can be a complicated business and isn’t recommended for the inexperienced do-it-yourselfer. There are a number of regulations, laws, and fire codes to be aware of, such as the type of fire you can burn and where the fire feature can be located in relation to nearby property lines and buildings. Rather than attempt to navigate these murky waters on your own, it’s highly recommended that you work with fire pit contractors who are fully licensed and insured. They’ll be up to date on all the current codes and able to construct your fire feature safely. That said, a fire feature is a wonderful way to add ambiance and warmth to your outdoor space, both literally and figuratively. It really brings in the “wow” factor, creating a cozy place for people to gather in the evening, or even during the day in winter. It can even increase the value of your home, though ultimately most people choose to add an outdoor fireplace or fire pit because they enjoy them. They allow you to be outside enjoying your space for more months of the year and give you a wonderful place to socialize or spend time together as a family. S’mores anyone? When we begin a fire pit construction project in Walnut Creek, we initially meet with the client to develop a design and budget that reflects the scope of their project. Our fire pit contractors take the approved design and build it out, keeping safety and quality at the forefront of their mind as they work. At the end of the day, our goal is to create a beautiful fire feature that you can enjoy for years to come. We also construct fireplaces and other fire features for outdoor kitchens, pool houses, and more. 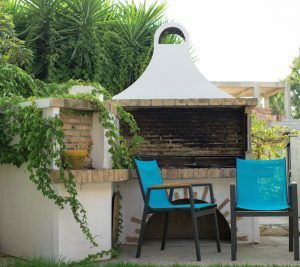 If you love your fire pit construction, we also offer plenty of other services to our Walnut Creek clients, including pool construction and renovation, cabanas, arbors, built-in BBQs, and much more. Don’t hesitate to call on us to help you create an outdoor space where you love to spend time! Please call us at 925-886-1300 to speak with a member of our team and schedule a service appointment or consultation.